As I have mentioned so many times in various posts, sometimes simple is the best way to go. It’s almost as if nature intended things to be this way. For example, ripe summer tomatoes tossed with fresh basil, buffalo mozzarella, Italian basil, olive oil, and sea salt is perfect. A salad caprese. Nothing else, with the exception of very good quality aged balsamic, is necessary. Nothing. It is completely complete. Pesto is another ‘complete’ condiment, or sauce. I call it a condiment, because when made correctly, it should be thick and spreadable, not pourable. Pesto, an old word for ‘to crush’, as in a mortar and pestle. Modern times, we of course use a food processor, though I’m sure if you were to grind the ingredients by hand with a mortar and pestle, your finished product would be incredible. It only has 5 ingredients. Italian basil, toasted pine nuts, Parmesan Reggiano cheese, garlic and extra virgin olive oil. Normally, the cheese is salty enough, but once in a while you will need to add a little good quality sea salt, for balance. Like a salad dressing or vinaigrette, pesto should be a little salty and intensely seasoned; the idea is that a little goes a long way and you really don’t want mild and subtle flavor. Pesto needs to be pronounced. Ingredients can, however, be substituted. Arugula, mint, walnuts, and so on, depending on what you want to achieve in the end. Leg of lamb stuffed with mint pesto can be excellent..
Bring a pot of salted water to a boil. Have a bowl of ice water and paper towels ready. Very quickly blanch the basil. To do this, submerge the basil in the boiling water for about 5 seconds and immediately transfer to the ice water. As soon as it’s cold, remove it from the ice water and place on the paper towel. Dry as best you can without squeezing the basil. 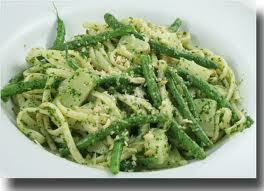 In a food processor, add the blanched basil, cheese, pinenuts and garlic. With the machine running, drizzle the olive oil until a thick pasta emerges. You will probably need to scrape down the sides a few times. If necessary, season with a little sea salt, but it probably won’t be necessary. Pesto is done.